Hyper allows its users to record all of their incoming and outgoing phone calls for follow up, analyzing and for future use. 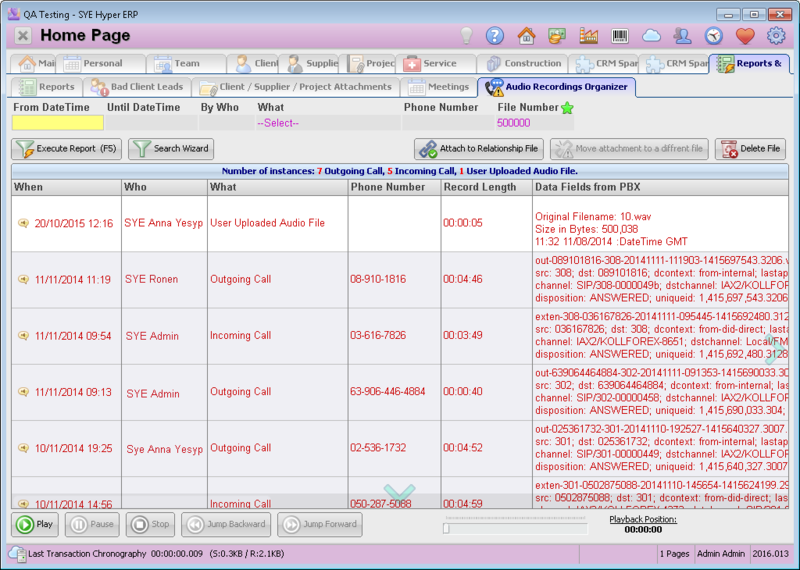 This tab gathers all of the user's phone calls to/from his position, that can not be automatically related to client / supplier card. The incoming and Outgoing phone calls of organization that uses this function, are automatically related to the Hyper cards of this phone number. The phone calls that can not be related to any of Hype’s cards, are automatically related to the POS Default Client Number, which represents the casual customers, that were not defined in the organization's system as clients. This Client Card is defined in the Local Computer Setup. Recording Date Fill in the "From DateTime" and "Until DateTaime" fields, according to the date of the required phone call. By Who Select the required user from the list. Phone number The required phone number. File Number Select the required card of Hyper to view its records. As default, this field displays Hyper's casual customers card. Press the Execute Report button, to display the list of the required recordings. Alternatively, use the Search Wizard button. Attach the selected record to the Relationship of selected Hyper card. Move this record to other selected Hyper card. Jump 10 seconds back / forward. The option of saving the recordings and relate them to Hyper cards, is available via separated interface. Contact SYE for further information.